This approach works often if a field is missing when a program is wrapped via LWS/MWS: Go back one step if it is possible.I.e., you can enter line charges in CRS277 directly in M3, with LWS/MWS you can’t. But it is possible to start in CRS275 and go to CRS277 as related option in LWS/MWS and you have the full functionality in CRS277. Not a problem. I finally got some down time to complete this entry. I have been working on it for a while now. Great work Seth! Have you looked into Heiko’s alternative solution? The “import MForms;” is included. Hi again, you mistyped “util”. Must be “Util”, with capital “U”. Dotnet languages are case-sensitive. The scritp is now compiled. …I’m going to buy new glasses ! Thank you for your Template, Seth. I’m now able to create the link between Fixed Assets and equipement transferred from SAGE. However, the Excel file is now locked. I tried to clear the Script cache, without success. Is there a specific command to release the Excel file ? Thank you again for your help. 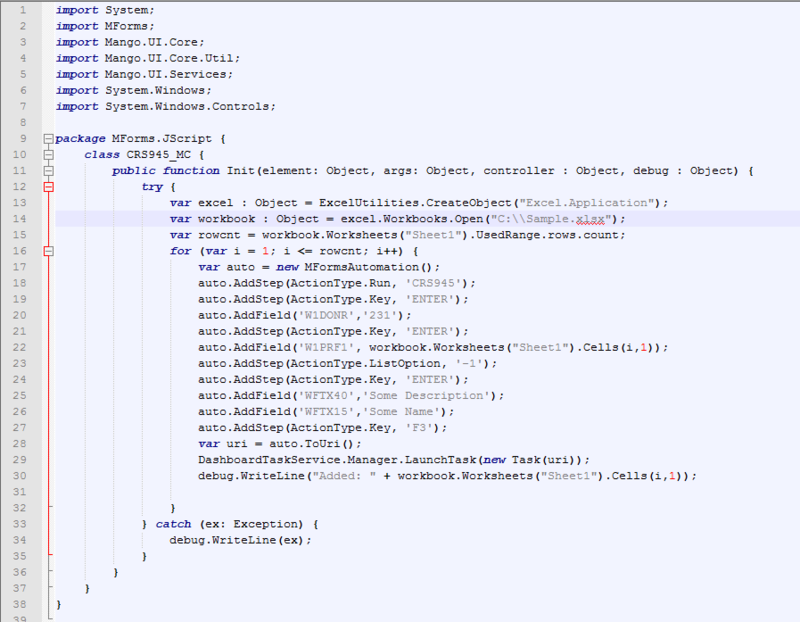 Even if you write compiled scripts in Visual Studio (C#-dll’s), logging remains important. Also, be aware that when your script starts with a M3 panel, rendering has not finished, you can’t access any control without delaying the execution by using a dispatcher. When you are not using extended logging, you will never be able to trace what your script really does in case of errors. This is one of the main reasons where people get surprised – everything worked fine in the script editor, outside it doesn’t. Excel as OLE object can be fully controlled from any external application. You can search the WWW for the objects workbook and excel.application. workbook.Close(null, null. null) will close you workbook without changes. Excel.Quit() will close the application. Then set workbbook = null and Excel = null to be sure that you have no more references. Many thanks for your answer, Heiko. I ‘ll try this method ! HI, Many thanks for guiding us in many ways. I have tried following script for doing mforms automation to add the departure date in MWS410 via excel. I got MNS921 popup box, and from that point onwards i am not able to access the text/date filed in the pop up box. 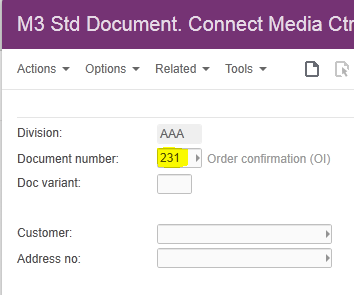 How can i proceed or what is the correct name for the MNS921 pop box text/date field(WWVAL1)? will try with your suggestions. will let you know if i find any solution. Great. And if you do find a solution, come write a blog post about it. I want to open OIS103 from OIS100 using MForms Automation, but as the OIS103 panel contains only read-only fields it doesn’t work. Is there is any way to use Automation on read-only fields?